Howard Friedman, President of the Trademark Society, NTEU Chapter 25 at the PTO, received the Lifetime Achievement Award from the Society of Federal Labor & Employee Relations Professionals. From left to right, SFLERP Second Vice-President Michael Fischetti, Mr. Friedman, and FirstVice-President May Silverstein. 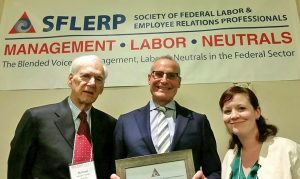 At the 44th annual Symposium of the Society of Federal Labor & Employee Relations Professionals (SFLERP), the Board of Directors presented the Lifetime Achievement Award to Howard Friedman. The award recognizes a member of the Society whose career exemplifies an outstanding degree of professionalism, high ethical standards, and an unquestionable dedication to the work of the Society. Howard Friedman is President of The Trademark Society, National Treasury Employees Union Chapter 245. The Trademark Society represents the attorneys in the Trademark operation at the United States Patent and Trademark Office. Mr. Friedman has served on the SFLERP Board of Directors as First and Second Vice-President and as President and continues to serve as an ex-officio member. He has presented at numerous SFLERP Symposia, at our regional training, and at the annual LR-ER training presented in the fall.